What I'm Altering Today: Have You Ever Said "Pass" on a Job? At first glance this looks like a typical Formal alteration. 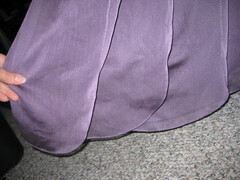 The shoulder need to be pulled up and the hem needs to be shortened. A closer look, however, tells me I really need to interview this job, to see if I want to take it on. It turns out I did something here that is truly rare for me... I declined. 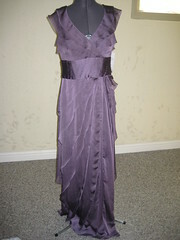 This is a beautiful mother of the bride dress, made from a very lightweight silk chiffon. The place where the lady bought it does alterations, but were going to charge her in the $130.00 range to shorten it, and an additional cost for taking up the shoulders. Our conversations revealed that she had been to 4 places, getting estimates for the alterations. So I look at the hem and realize that all of these panels are individual and need to be individually shortened and the curves recreated. This would have been less of a problem if they had been free from the dress, kind of like streamers, hanging from the waist. But no, they are all attached to one another, with multiple layers of lining beneath. Each has to be disconnected from the next, shortened, reshaped and then reattached. 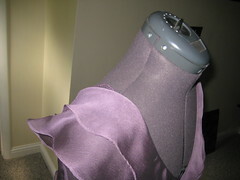 Another nightmare for the shoulder area, because there is no shoulder seam. Sometimes this is not a problem, but this dress requires that I add a shoulder seam. The client is ok with this, but upon reflection, it was better for her to pay the store to alter it. Their tailors are paid by the hour, not the job. I would have lost money accepting this job! Thanks for posting. It is a lovely gown, but a wise decision to send her back to the store. Evidently the designer envisioned that only tall, lengthy women would purchase this gown.